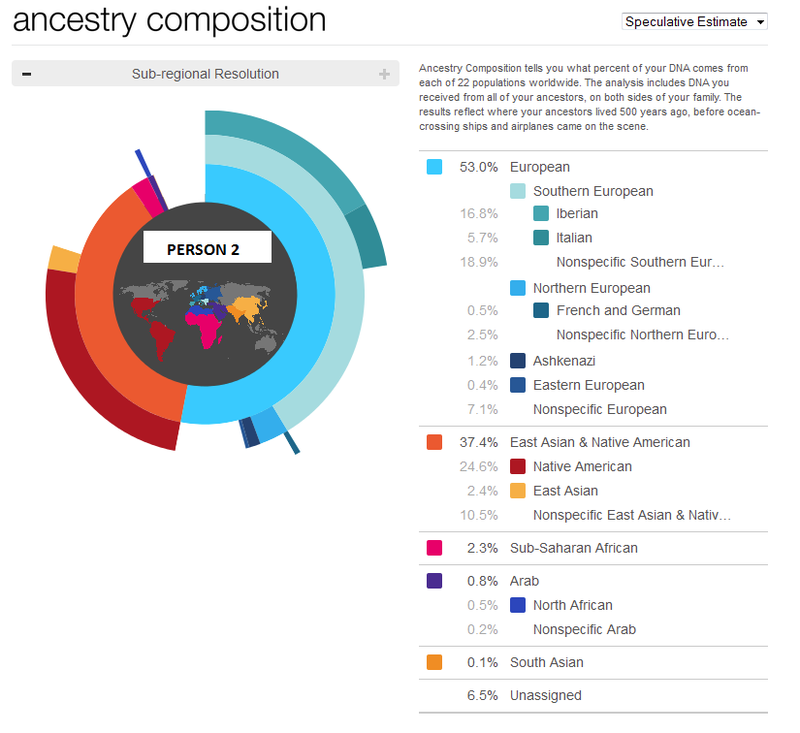 23andMe's latest feature, Ancestry Composition, is finally here! 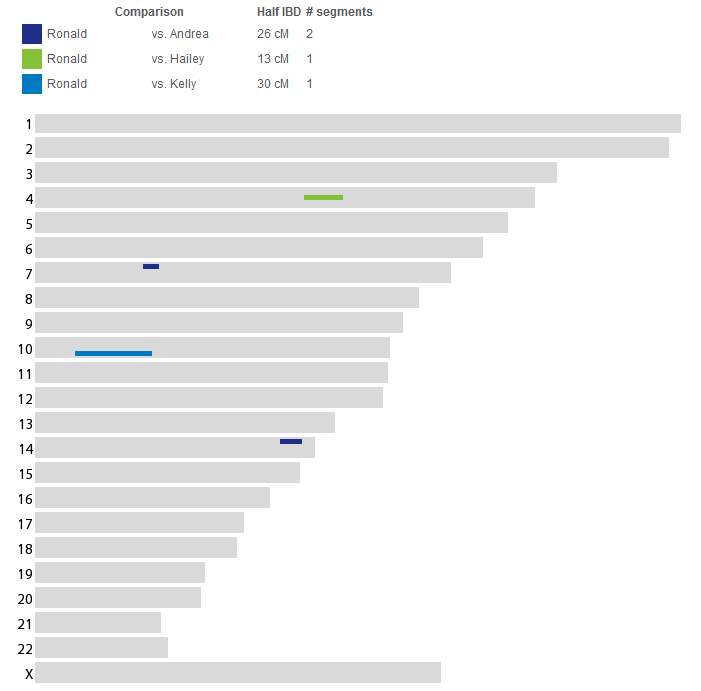 I am going to examine the Ancestry Composition chromosome paintings and ring charts from a wide variety of 23andMe members so that we can see how Ancestry Composition differs from the old Ancestry Painting, and how the results compare to what people know about their own ancestral background. Here is Person 1's original Ancestry Painting. 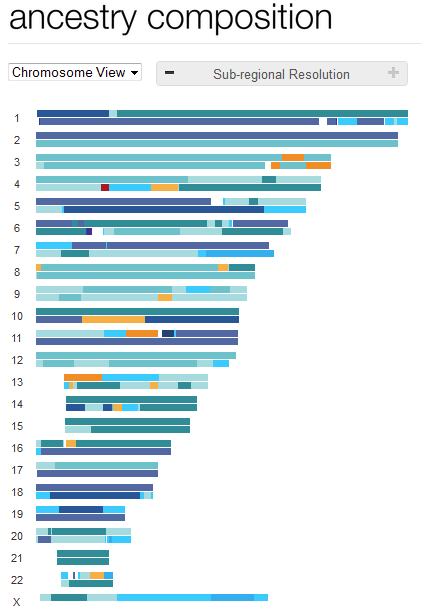 Person #1 has European ancestry from a variety of countries -- in Ancestry Painting 1 (hereafter referred to as AP1), all of this European ancestry is represented by the plain dark blue. 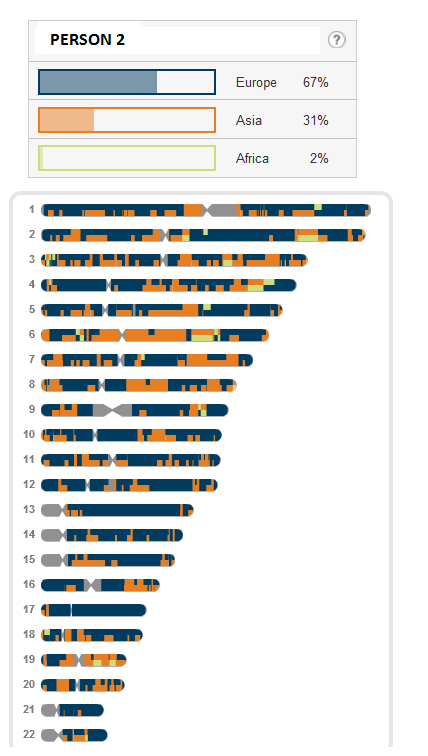 Person 1 also inherited a number of non-European segments from his Native American great-grandparent, which are highlighted in orange. Overall, in AP1 this person gets a 96% European and 4% Asian score. 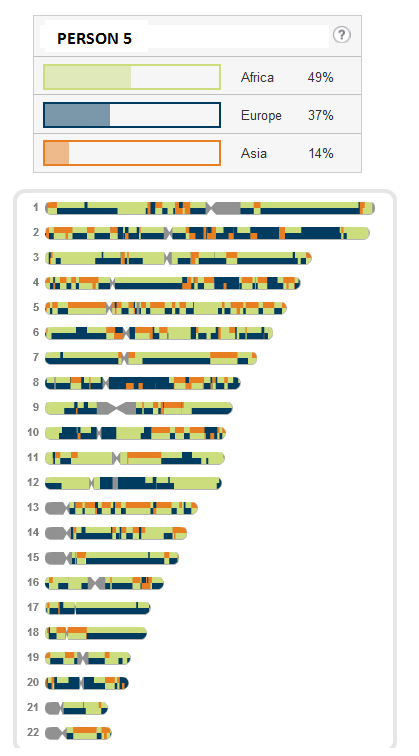 Here is person #1's new Ancestry Composition. You can see that his European ancestry is now broken down into subgroups. He has one Welsh great-grandparent and one British great-grandparent. Each one of these ancestors contributed an estimated 12.5% of person #1's DNA. He also has a great-grandparent who is part Scottish. Overall, he is approximately 30% British. His "British and Irish" score hits the mark almost perfectly -- 24.2%. Person #1 is approximately 50% German. 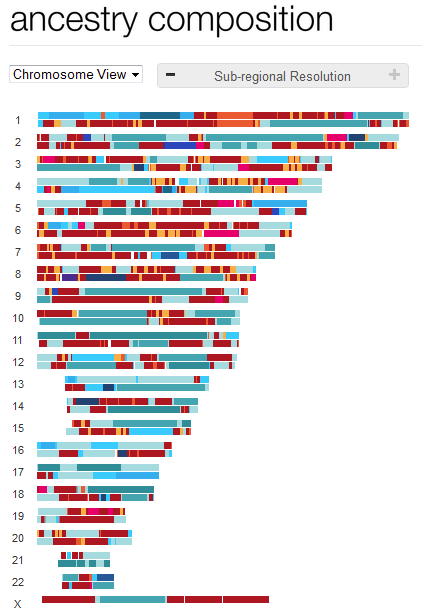 Ancestry Composition picks up on this DNA in several ways. His "French and German" score is 13.7%. Also, his "Eastern European" score is 4.3%. Historically, borders have changed & the German and Polish ethnic groups have interbred quite a bit. This means that Person #1's German ancestors likely had deeper ancestry that could be traced back to Eastern Europe, and this is what is showing up in Person #1's Ancestry Composition. So, we're up to 13.7% French and German + 4.3% Eastern Europe = 18 of Person #1's total of 50 percent German ancestry is accounted for. Not all of Person #1's German DNA is able to be tagged as uniquely and solely German. For more information about this, please visit this FAQ as well as this excellent guide that 23andMe has published. What we can conclude from this is that much of Person #1's German DNA is unable to be tagged as DNA that is found only in German -- therefore it is under the category of "Nonspecific Northern Europe" and "Nonspecific Europe." Person #1 also has a small amount of Ashkenazi admixture. 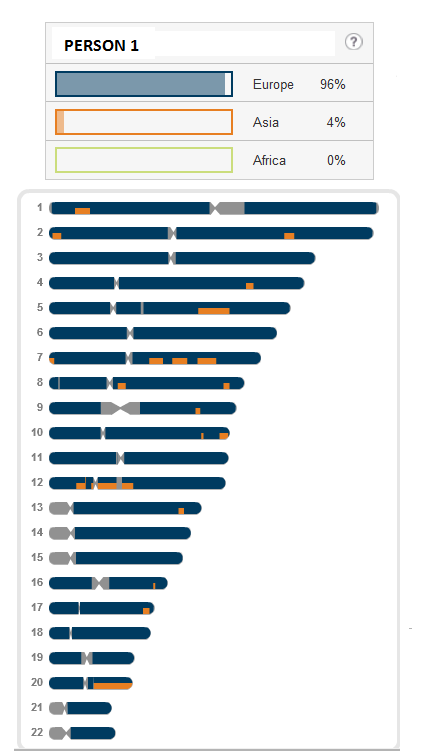 In AP1, this admixture remained undifferentiated from Person #1's European DNA. 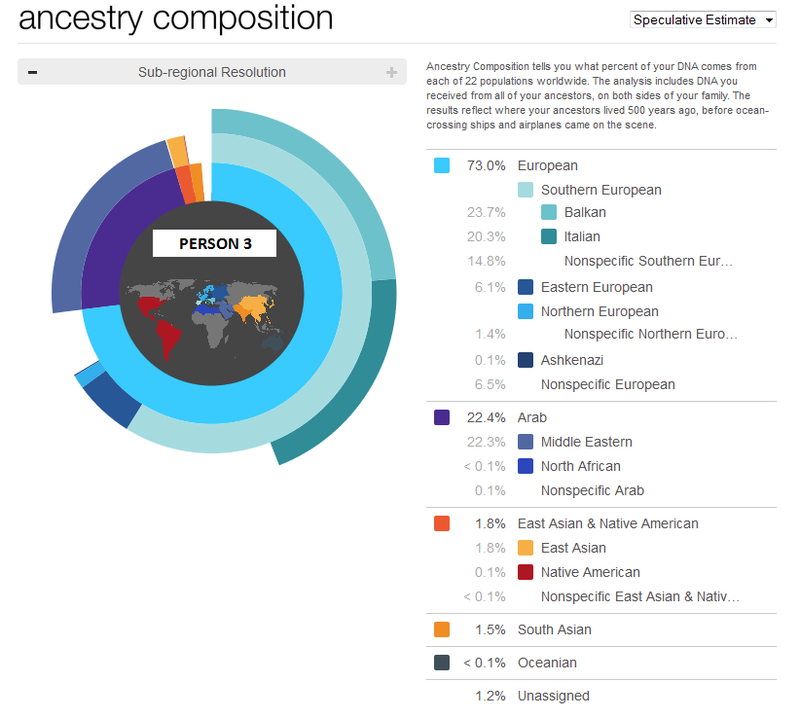 But Ancestry Composition has tagged it all perfectly. Person #1 gets a score of 2.4% Ashkenazi. 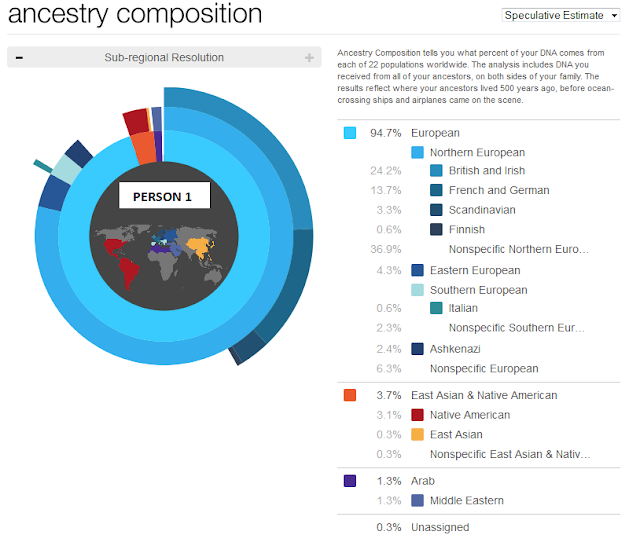 Ancestry Painting 1 was able to successfully differentiate Person #1's European DNA from his Asian DNA. But Ancestry Composition goes one step further -- it is able to accurately determine that Person #1's Asian DNA is Native American in origin. Before, with AP1, a variety of Asian DNA such as Chinese, Japanese, and Native American were all placed in the same category and unable to be differentiated from one another. But with Ancestry Composition, Person #1's Native American DNA that he inherited from his Native American great-grandparent is correctly tagged as such. Once again, we see that Ancestry Composition has done an excellent job at further subdividing this person's DNA into different world subgroups. Previously, Person #2's DNA was categorized into just the three simple categories: Europe, Asia, and Africa. Just by looking at Person #2's AP1, you wouldn't really be able to guess which region of the world she originated from. 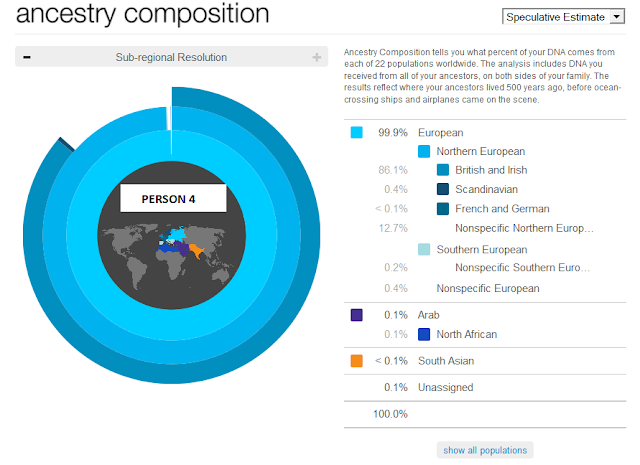 Ancestry Composition makes this much clearer. The generic Asian DNA from AP1 is now highlighted as being predominantly Native American in origin. We also see that a significant portion of Person #2's European DNA can be properly categorized as Southern European DNA, much of which can be further tagged as originating from Spain/the Iberian peninsula. Before, with AP1, we saw generic European DNA plus generic Asian DNA plus a smidge of African DNA. That doesn't say much about this person's origin. But with Ancestry Composition, this person's mestizo heritage -- Native American plus Iberian -- comes through quite clearly. It's a very similar story with person #3. His AP1 is quite similar to person 1's, so it's reasonable to suppose that, like person #1, he also has primarily European ancestry with a distant Native American ancestor. Just by using AP1, there's no way of proving or disproving this hypothesis. Ancestry Composition comes through and delivers a strikingly different picture, though. This person has a mix of Bulgarian and Turkish ancestry, and accordingly, Ancestry Composition clearly tags much of this person's European DNA as being Southern/Eastern European, with the lion's share tagged as originating in the Balkan peninsula. Ancestry Composition zooms in a bit deeper and is able to readily identify all of the British Isles heritage that person #4 has. Her ancestral background is 100% British and Irish, and her Ancestry Composition score is 86.1% "British and Irish." The leftover portion is largely tucked into the "nonspecific Northern Europe" category, meaning that some of her British/Irish DNA is not specific to the British Isles, but is instead found throughout Northern Europe. 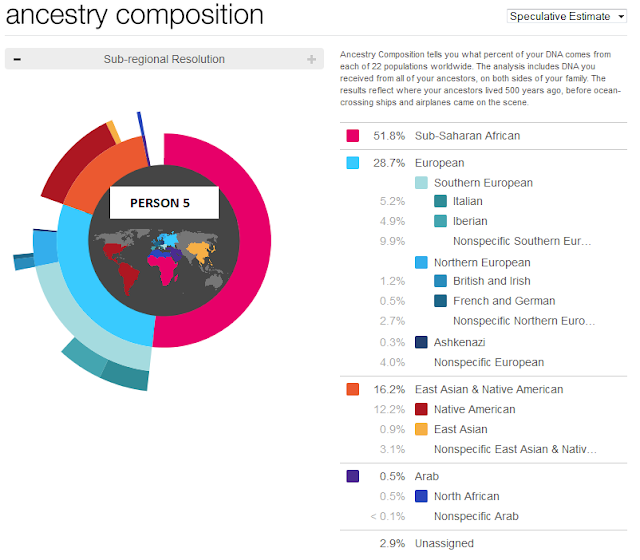 There are a couple of tiny segments showing a very small amount of North African ancestry. This could be statistical noise or it could be indicative of a trace amount of DNA from a historical migration pattern. One thing I want to highlight in this person's painting that I haven't previously discussed is the power of phasing. Phasing means separating your maternal complement of chromosomes from your paternal complement of chromosomes. 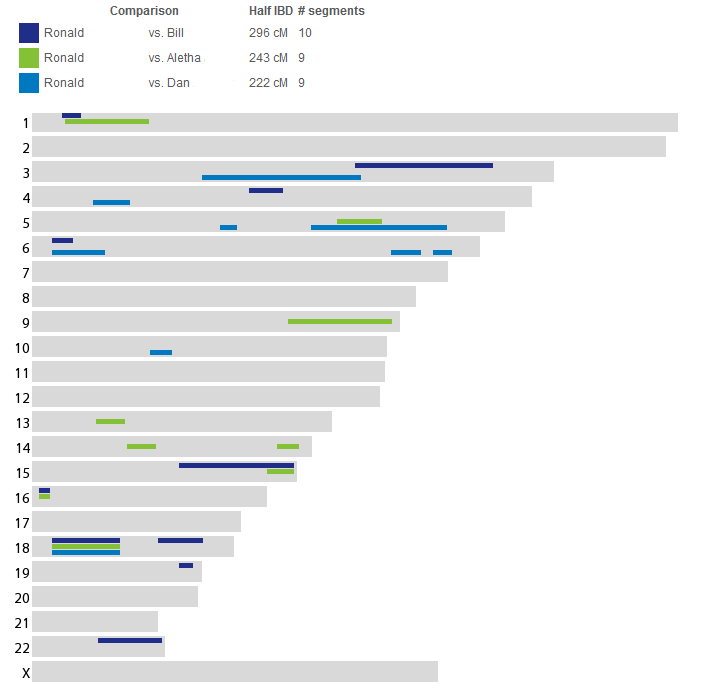 Ancestry Painting #1 was entirely unphased, but Ancestry Composition contains a step in which the genome is phased (for more info, read here). 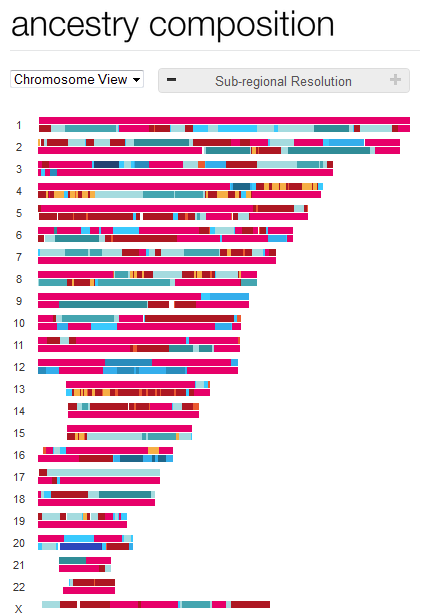 Separating the paternal side of your genome out from your maternal side gives you a clearer picture of what you are looking at in terms of your ancestry. Here's an example, with AP1 on top and AP2 on the bottom. In AP1, it's a zigzag mess with tiny Asian, African and European chunks interspersed with one another. This is because the data is unphased. Phasing smooths it out dramatically and we can now see, for example, that this person inherited a large piece of African DNA from one parent on chromosome 5 and Native American DNA from the other parent. It's separated out rather than hodgepodged together like it was with AP1. This can potentially be a great help when used in combination with Family-Inheritance and Relative Finder -- phased chromosome painting may show more clearly what region a shared segment likely comes from. Getting your close family members tested is immensely useful when trying to sort out your Relative Finder matches. Close relatives share some of your DNA, and they will also share some of your relatives. It’s very straightforward when a family member shares the same relative in common as you do, like this. In this case, my paternal first cousin shares the same segment with the same relative as I do. This provides clear evidence that this relative is related to me on my paternal side. However, sometimes you can make a conclusion about which side a relative comes from even when a family member does not share the relative. Let's say I want to try to figure out which side of my family this relative is on. Although I have lots of relatives tested, to keep things simple, I am going to pretend that the only person I have available to use is my paternal half-sister Kim. The first step is to take note of the segment's location. This segment is on chromosome 2, and has a start point of 140.000.000 and an end point of 151.000.000. 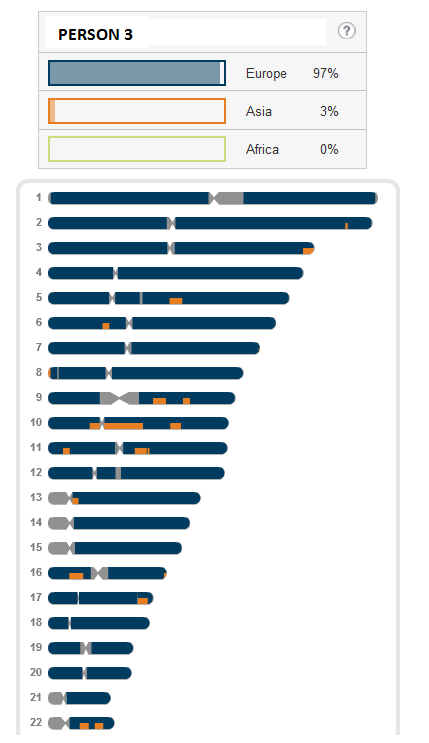 The next step is to take a look at how I match my half-sister at that spot on chromosome 2 (this info is found using the 'View in a Table' feature in Family Inheritance: Advanced). I need to check and see if Kim and I share DNA at the same spot as my 5th cousin and I do. And we do -- Kim and I have a shared segment that goes from position 129.000.000 to 181.000.000, which definitely encapsulates the segment that I share with my 5th cousin (140.000.000-151.000.000). This means that I can make a conclusion about which side of my family this match comes from. (Please note that if Kim and I did not share a segment at the same spot that I match my relative, no conclusion could be made). 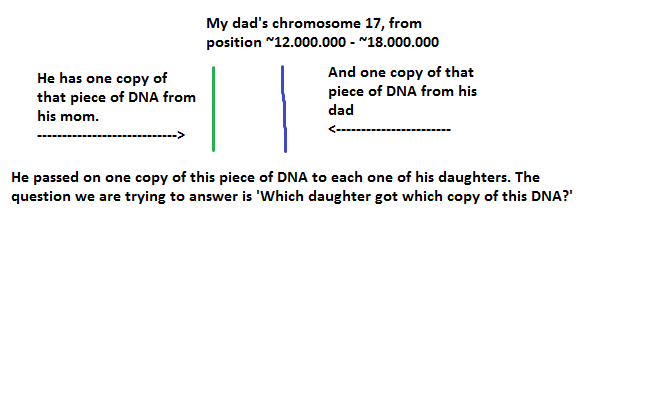 I know that I have two copies of chromosome two, one from my mom, and one from my dad. Kim and I got the same chunk of DNA on chromosome 2 from my dad (I know this because Kim and I are related only through my dad and not my mom). Therefore, if Kim also shares this match with me, this relative is on my dad's side. This is not the case -- Kim does not share this relative with me. Therefore I know this relative is not on my dad's copy of chromosome 2. The only other possibility is that this relative is on my mom's copy of chromosome two, and therefore I know that this relative is related to me on my mom's side. You can sort out which parent your Relative Finder match came from by using collateral relatives that are related to one of your parents but not the other. Close relatives in this category include half-siblings, aunts and uncles, and first cousins. Siblings do not work for this because they are related to both of your parents and all four of your grandparents, just like you are. Therefore any shared DNA and shared relatives that you have with your sibling could have originated with either parent. 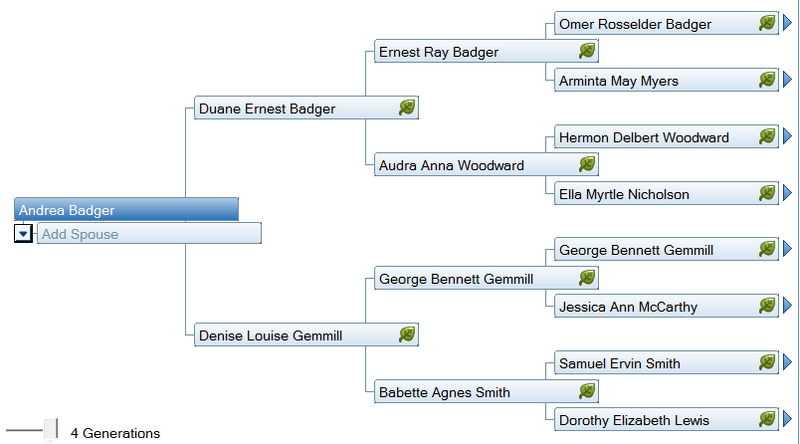 You can sort out which grandparent your Relative Finder match came from by using collateral relatives that are related to only one of your grandparents. Close relatives in this category include half first cousins or first cousins once removed, second cousins, great-aunts and great-uncles, and a variety of other relatives. If you have a more distant relative tested, like a first cousin twice removed or something like that, it's possible to narrow down which great-grandparent a match comes from, and so on. Also, if you have direct ancestors tested, the process is very similar to what I outlined above and in fact in some cases it's a little simpler. If you've got one of your parents tested, let's say your mom, and your Relative Finder match does not match your mom, you can reasonably conclude that the relative is on your dad's side. If you have a grandparent tested, and the Relative Finder match is not shared with your grandparent, you would follow the same checking-the-segments procedure that I outlined with Kim. This method isn't perfect -- it's possible to have a 'false positive' match -- this means that your Relative Finder match does not match either one of your parents. It's also possible that a testing error, such as a miscall, will prevent a legitimate relative from properly showing a shared segment. But for the most part, comparing the segments like I outlined above should work for you. The larger the segment, the more accurate using this method is. You can also use the knowledge that you get ONE chromosome from mom and ONE chromosome from dad to your advantage when trying to sort out your relatives. What this means is that at any given spot in the genome, you share DNA with one and only one of your maternal ancestors and one and only one of your paternal ancestors. If I share DNA with, let's say, my grandfather Ernest Badger, at a certain spot in the genome, I know for sure that I do not share DNA with my grandmother Audra Woodward at that same spot. Graphically illustrated, this is what it looks like. At any given location, you can share DNA with one paternal grandparent or the other, but not both. You can share DNA with one maternal grandparent or the other, but not both. Let's take a look at an example Relative Finder match. Andrea, Kim, Kelly, and Hailey are the four daughters of my dad. Aletha is our paternal aunt and Leona is our paternal first cousin once removed. Using the tools I've outlined above, let's see what we can find out regarding the side of our family that these relatives come from. I told you earlier that aunts can sort out which parent a match comes from, and first cousins once removed can sort out which grandparent. So we know that our match 'Jack' comes from our dad's side, and our match 'David' comes from our paternal grandfather's side (because Leona is related only to our paternal grandfather, and not our paternal grandmother). We don't have to stop here, though. 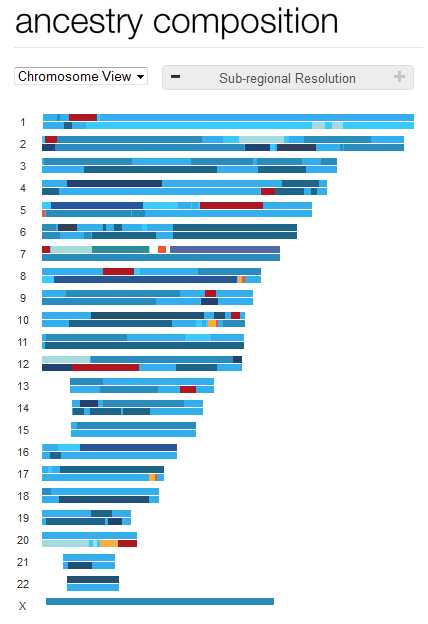 By using the 'ONE piece of DNA = ONE ancestor' rule and by visualizing the chromosomes, we can make another conclusion -- we can decide which grandparent our match Jack comes from. 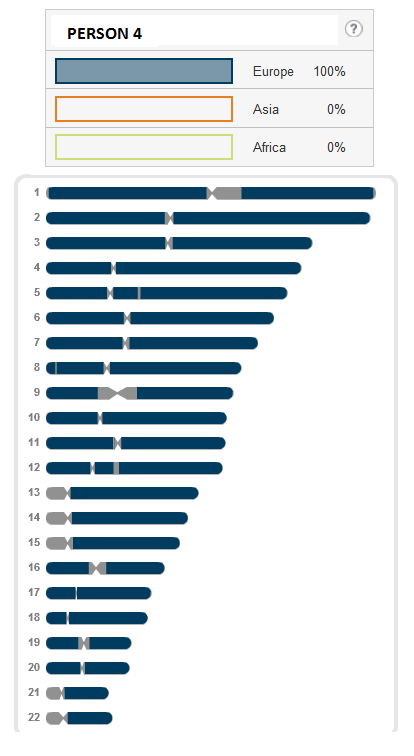 Here's a sketch of my dad's chromosome 17 at the relevant spot. Now let's look back at our Relative Finder matches. Andrea, Kim, and Kelly all have the same relative and therefore the same piece of DNA. Hailey has the same relative and therefore the same chunk of DNA as our paternal first cousin once removed, and this cousin is related only to our paternal grandfather, my dad's dad. Therefore, Hailey got the 'blue' piece of DNA. So here's what we have so far. Let's think about this for a minute. We know several things. 1. Every child inherited a piece of that DNA from dad. 2. Andrea, Kim, and Kelly inherited one piece, and Hailey inherited the other piece. 3. Hailey inherited the blue piece. This leads us to our conclusion -- Andrea, Kim, and Kelly inherited the 'green' piece of DNA, the piece from my dad's mom (our paternal grandmother). We can now conclude that our Relative Finder match 'Jack' is related to us on our paternal grandmother's side. I recently got results for my dad’s second cousin. Here is how Ron matches with his second cousins -- nothing unusual here. Second cousins are expected to share about 3.125% of their DNA, and everyone shares approximately this amount with Ron. Things start to get weird when looking at the comparisons between Ron and my three sisters and I. We are second cousins 1x removed, and would be expected to share about 1.5% of our DNA. One of my sisters has a fairly normal match to Ron, although her percentage is slightly above average. Surprisingly, she passed on every single segment perfectly intact to one of her daughters. Her other daughter got most of the segments -- she shares about 70% of the DNA Ron shares with her mother compared to the expected 50%. My dad's other three children have only a very small match to Ron. We share about three or four times less DNA than expected. These results are more consistent with a fourth cousin as opposed to a second cousin 1x removed. After looking at this comparison, it might be tempting to conclude that because we have such a small match compared to the average percentage for second cousins 1x removed, our dad probably had a smaller than average match too. However, there is no evidence to suggest this. 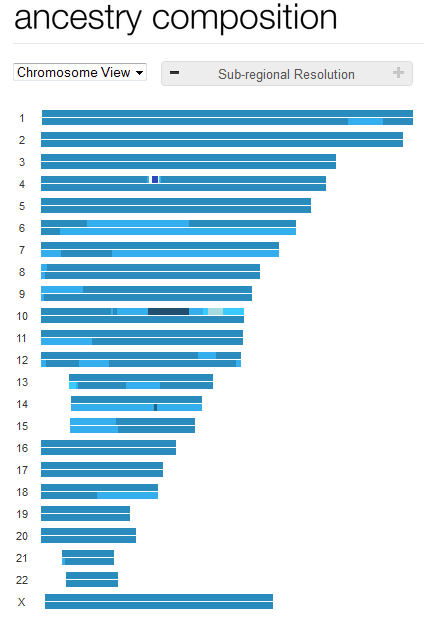 If you add up all the unique segments that my dad’s four daughters inherited from him, it’s 13 + 43 + 38 + 29.5 + 18.5 + 44 = 186 cM = at least 2.48% of DNA shared between my dad and Ron (there’s also a decent chance that Ron and my dad shared segments that none of his daughters happened to inherit). This percentage is slightly below average for second cousins (2.48% compared to 3.125%), but not dramatically low. 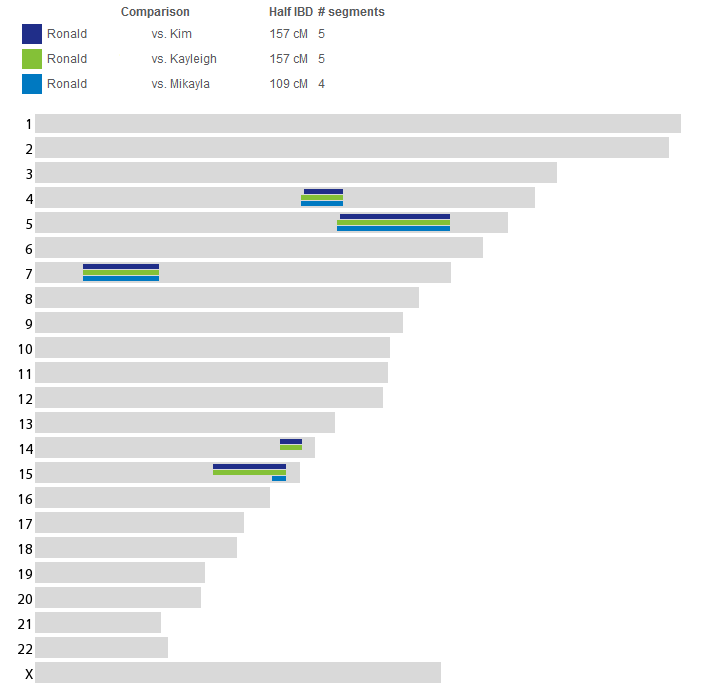 However I only received 26 out of 186 cMs, or about 14% of Ron’s shared DNA compared to the expected 50%. My sister inherited a piddly 13cM out of 186cM, or about 7% of the shared DNA. Sister #3 inherited 30 cM out of 186 (16% of the shared DNA). Sister #4 seems to be skewed in the other direction -- she inherited 157cM out of 186cM (84% of the shared DNA). Can I coin a ‘new’ saying? 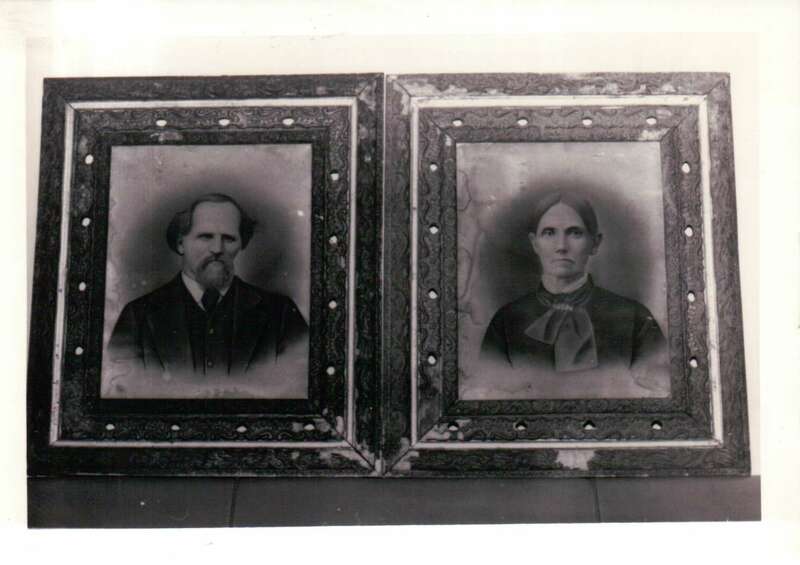 Jason Woodward and Dorotha Drew Woodward, our common ancestors.